Have you ever looked at furniture in a store and wondered how that perfectly smooth antique looking finish was created? I have. I often shop HomeGoods, Tuesday Morning, and Kirkland’s, mainly looking for home décor ideas. I sometimes fall in love with an item but I very seldom buy it. I come home and try to find a way to recreate that fabulous look…..on a budget. 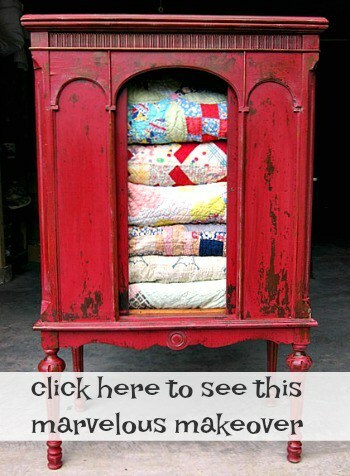 There are a couple of different techniques I use to antique furniture. I don’t know that any one technique is better than the other, they’re just different. Several years ago when we lived in Florida and I started my painting/diy adventures I painted a number of hope chests/trunks/cedar chests similar to this one. The look was very popular and the chests usually sold right away. 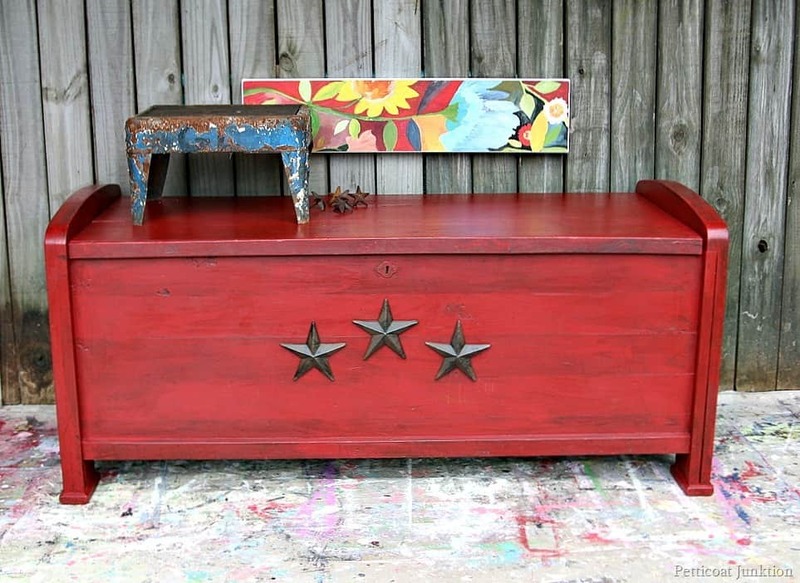 I antiqued the paint on this cedar chest using a very, very, simple process. I promise to post the how-to next week. I bought the cedar chest at the Nashville Flea Market. It’s in great shape and the wood is really pretty. I planned to clean it up and renew the wood finish with hemp oil. Every time I looked at the chest all I could see was a coffin….I know…I hated to say it….but that’s what it looked like to me. I decided to paint it. I know some of you will probably think I shouldn’t have and you can tell me…..nicely. Now it doesn’t look like ….well, that word I said earlier. I’m happy with the finished look. 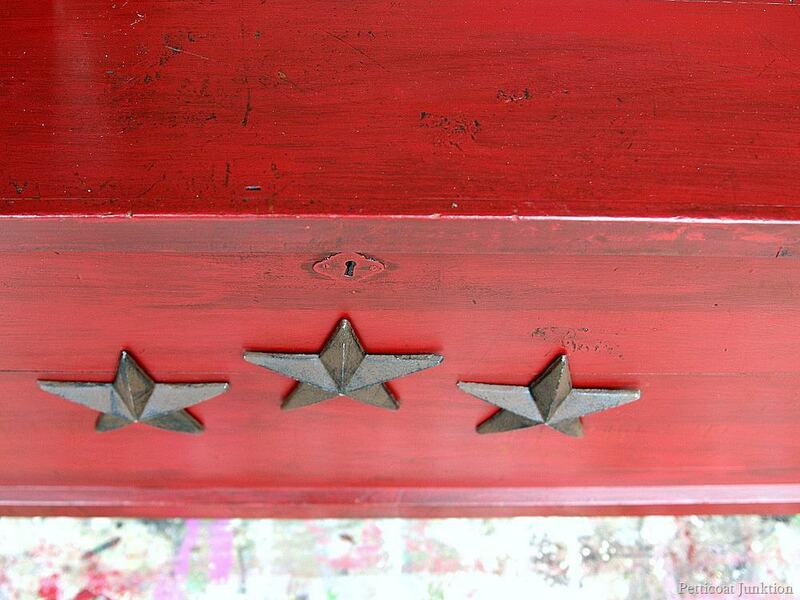 The iron stars are nailed on. The stars have a nail on them. Not sure what the proper name is….star head nails? What do you guys think of the project? Have you tried to reproduce a specific furniture finish or look? I’ll post the technique for this finish next week. 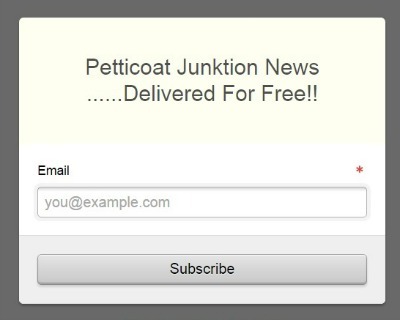 Hello Petticoat Junktion ! So story to tell ! My husband and I live to antique window shop. We are military and don’t have room to be frivolous 😉 wish we could ! Anyways, we saw the chest in a cute store in Clarksville and my husband and I fell instantly in love. But, we didn’t leave with it. We just moved to the army base and we were still deciding decor. 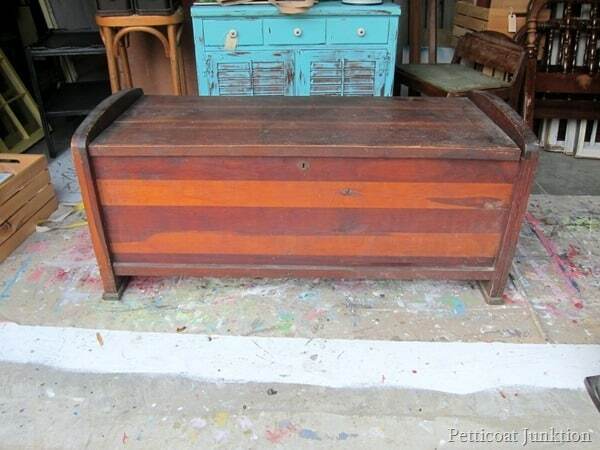 Well, today I was fed up with poor furniture quality and I remembered about the chest that we o-so- loved. Hoping it was still there, dashed down as quick as I could and it was. It was meant to be and I am in love. My husband lives it too, especially, it matches his military decor part of the house. I will send a picture once set in place and decorated. Thank you, Thank you, thank you for your finds and talents. Most of all being on a military budget it was an affordable piece ! You are so sweet. 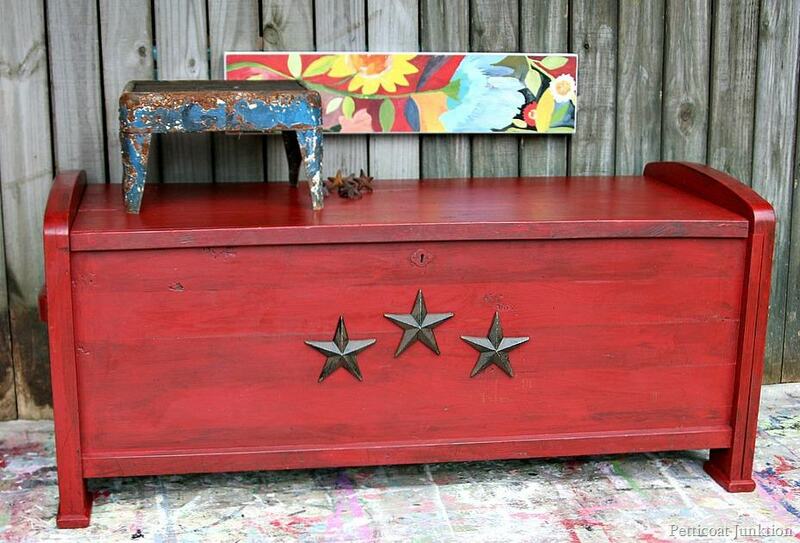 I’m glad the red cedar chest with the iron stars is going to a good home. My husband is retired from the Army so I know all about Army life. He was in the service for 25 years. I hope you are enjoying Clarksville. What is the brand/color of the red paint? I can’t tell you specifically Pam. It’s a mix of colors. I do that sometimes. I just start mixing what I have on hand until I get the color I want. Thank you so much for showing us all these colors! When I finally get brave enough to tackle some furniture, I know just which colors I want to use! You definitely took it from coffin to mouth drop’n Kathy! Love the color, love the antiquing, and love those fabulous stars. Very nice makeover. I give it 3 Stars! Awesome! The only thing I would have done would be to paint the lock the same color as the stars; I know a lot of trouble but just my opinion!!! Thanks for the comment Donna. That’s an idea. I wonder if that would take the focus off of the stars? I know. They are cool. I used to order them by the dozen from Ebay. I only had small stars left in my stash and when I went to order more stars the price was higher and there was not a large range of sizes. I used to be able to get larger stars. 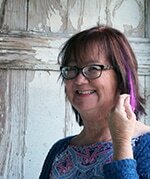 I went to the flea market Saturday – it was a beautiful day for it! Came home with a cute stool to paint and recover. I sure enjoy seeing the pieces you have redone!